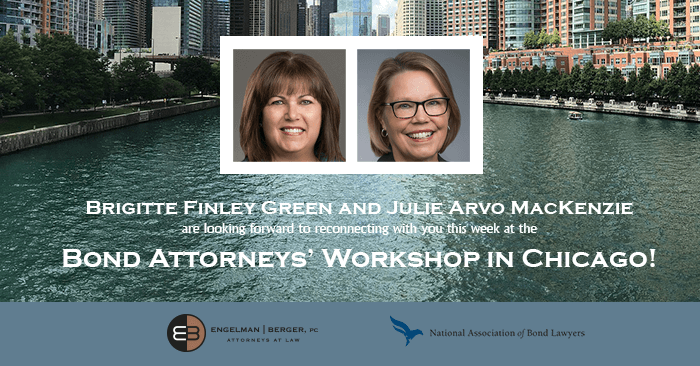 The National Association of Bond Lawyers will host its 43rd annual workshop in Chicago on September 26-28, 2018 at the Fairmont Chicago. Engelman Berger’s Julie Arvo MacKenzie and Brigitte Finley Green will be attending. The event will host 31 different panel presentations on topics covering virtually every area of public finance. The workshop will provide attendees opportunities to strengthen their technical knowledge, learn the best practices for dealing with legal liability, earn ethics credits, learn about current trends and developments in tax and securities law, and hear from leading practitioners and industry experts. Engelman Berger is looking forward to hearing about the latest in bond finance from Julie and Brigitte.